Personally, I don't want them to be too different. I like the way the world financial center looks, with all the towers very similar. Although I do agree with what you say. The WFC is a perfect example of this. You can't admire each of the buildings for their own because they look so alike. But I would prefer at least that they all have the same facade so it won't look like a mess. It'd be nice if they all had their own unique qualities(like the roofs on WFC) but still be similar in appearence(like the facades of WFC). This way you can at least tell they are part of the same complex. I also am glad that the tower will be one tower, instead of a spire connected to a tower. I agree that it'll be much safer. I also think it'll make it look much better. It will make the REAL office building seem taller. Since they are one building now, there can be no argument over what really is the Freedom Tower and what its real height is. Also, hearing about this wind power, I'm getting very excited. I hope they can make it work. 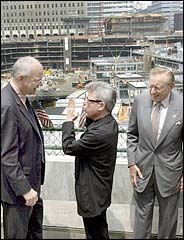 The architects David M. Childs, left, and Daniel Libeskind, center, with Larry A. Silverstein at the trade center site in July. Only 10 months before groundbreaking is expected to take place for the Freedom Tower at the World Trade Center site, the master planner of the site and the architect for the tower's developer, who are supposed to be collaborating, have reached an impasse on how the skyscraper should look. Although the version being designed by David M. Childs, of Skidmore, Owings &amp; Merrill, for the developer, Larry A. Silverstein, has not been seen publicly, it is stylistically quite different from the widely publicized images of the Freedom Tower drawn up by Studio Daniel Libeskind as part of its master plan. Mr. Libeskind has called for an asymmetrical composition: a slender, antenna-topped spire rising along the western edge of an office tower, abstractly complementing the Statue of Liberty on the skyline. Mr. Childs has proposed a more monolithic and symmetrical structure that would twist and taper as it rose, culminating in antennas surrounded by an open framework. The differences are more than cosmetic. Without an agreed-upon aesthetic approach, there can be no detailed drawings. Without drawings, there can be no construction. So the pressure to find common ground is enormous, particularly since Gov. George E. Pataki has set Sept. 11, 2006, as the deadline for the topping off, or structural completion, of the Freedom Tower. Asked whose vision would prevail, those involved answered yesterday that the collaborative effort would resume and that Mr. Libeskind and Mr. Childs would pick up again after an uneasy meeting four days ago. "Every artistic collaboration in history had its fits and starts, but they are ultimately judged on what they produced," said Matthew Higgins, chief operating officer of the Lower Manhattan Development Corporation, which is planning the site with the Port Authority of New York and New Jersey. "In this case," Mr. Higgins said, "we are confident that Libeskind and Childs will design a Freedom Tower that will make our entire nation proud." He said the corporation was not even considering the prospect that the two architects would fail in a collaborative effort. Mr. Libeskind said he had tremendous respect for Mr. Childs's ability. "We both have strong opinions about design," he said. "Nothing worthwhile was ever created without some conflict, and what emerges from a collaboration should be even greater than the sum of its parts." Employees of Studio Daniel Libeskind, at 2 Rector Street, are working in the Skidmore, Owings &amp; Merrill office at 14 Wall Street. "Sometimes we shoot quickly ahead and sometimes it slows down," Mr. Childs said. "We're proceeding toward what we both believe will be a magnificent end result." And Mr. Silverstein, while acknowledging that there were issues between the architects that "need to be worked through," said yesterday that he still expected the collaboration would produce an exceptional tower. But these public pleasantries do not change the fundamentally awkward arrangement — by no means unique to the trade center site — that arises when prominent architects are compelled to work together, one of them on a master plan for a complex, one of them on a building design within the complex. Complicating matters is that while the Port Authority owns the 16-acre site, Mr. Silverstein is the long-term leaseholder. So the redevelopment process has long reflected the tension between the needs of the public and those of a commercial landlord who is expected to have at least $3.5 billion in insurance proceeds with which to finance reconstruction. Mr. Libeskind's master plan for the site was chosen in February by the Port Authority and the Lower Manhattan Development Corporation after an international competition that, at one point, included Skidmore. Seen around the world, the Libeskind concept, called Memory Foundations, showed an array of towers around the memorial area, rising to a 1,776-foot skyscraper at the northwest corner of the site, which Governor Pataki named the Freedom Tower. In May, Mr. Silverstein said Mr. Libeskind would not actually design the Freedom Tower, though he promised that it would "reflect the spirit of Dan's site plan." Instead, he chose Mr. Childs, with whom he was already working on the 7 World Trade Center office building project across Vesey Street. Two months later, the development corporation announced a "historic collaboration" on the tower between the Skidmore firm, which was to serve as "design architect and project manager," and the Libeskind studio, which was to be the "collaborating architect during the concept and schematic design phases" and a "full member of the project team." What must be resolved, however, is the vital issue of whether the tower is meant to be a hybrid of distinctive ideas or a Skidmore, Owings &amp; Merrill design that will be critiqued by Studio Daniel Libeskind. A revised version of the Memory Foundations plan that was presented last month continued to show an asymmetrical, angular Freedom Tower with a side spire rising to a pinnacle. Asked at the time whether the completed building would resemble his model, Mr. Libeskind replied, "Well, I'm an optimist." Mr. Childs and Mr. Libeskind appeared together three weeks ago with three more architects whom Mr. Silverstein has brought into the project: Norman Foster, Fumihiko Maki and Jean Nouvel. "This is not an assault on Danny's talent," Mr. Childs said that afternoon, noting that the master plan always anticipated the participation of a number of architects. This week, as efforts were going on behind the scenes to smooth over the differences between the architects, Mr. Libeskind gave a lecture about the design process at the National Building Museum in Washington. "Look, I come from a Hasidic background," he said on Tuesday night. "I know forced marriages and they always worked for a long time." " Sources close to Libeskind said that Childs, with Silverstein's support, will not budge from his design for the building and that Libeskind is prepared to walk out if his vision is compromised." "I have a tremendous respect for David's (Childs) ability, and we both have strong opinions about design," Libeskind said. "Nothing worthwhile was ever created without some conflict, and what emerges from a collaboration should be even greater than the sum of its parts. The Freedom Tower will be no exception." The two architects in charge of the World Trade Center site's first new building are struggling to reach agreement on its design and will meet tomorrow to sort out differences, sources said yesterday. Daniel Libeskind's initial design for the trade center site, which included the 1,776-foot-tall Freedom Tower, was selected in February. Leaseholder Larry Silverstein's architect, David Childs, was named leader of the building's final design team. Despite yesterday's public proclamations of a collaborative partnership, sources say the two architects have been arguing about the Freedom Tower's design since their last agreement was reached after an eight-hour negotiation session in July. Sources close to Libeskind said that Childs, with Silverstein's support, will not budge from his design for the building and that Libeskind is prepared to walk out if his vision is compromised. "Friday's meeting will ensure that the design of the Freedom Tower stays on schedule," said Matt Higgins, chief operating officer of the Lower Manhattan Development Corp., which hired Libeskind. Libeskind and Silverstein are bound by Gov. George Pataki's charge to lay the Freedom Tower's foundation in August 2004 and to complete the project by Sept. 11, 2006, the fifth anniversary of the terrorist attack. Libeskind has shown willingness to compromise, said one source, such as raising the memorial space from 70 feet below street level to 30 feet below street level; adding television antennae to the top of the Freedom Tower; and shifting the placement of the five office towers slightly to make them more attractive to potential tenants. Still, he did not have to compromise in other areas. Pataki would not allow Silverstein to move the Freedom Tower from the site's northwest corner closer to the transit hub. The towers have become slimmer, but the basic size and shape has not changed. It's not clear what their disagreements are or how far apart they are. Asked if Childs was unwilling to change his proposal, Silverstein spokesman Howard Rubenstein said Childs "has always said he will work with Libeskind to come up with an excellent and acceptable plan." "David Childs and Daniel Libeskind have been working collaboratively since July to design the world's tallest building, the Freedom Tower, on the timetable laid out by Governor Pataki," Rubenstein said. "As is customary in any highly complex design effort, issues have arisen from time to time that need to be worked through. That process is continuing, and we expect that the resulting Freedom Tower will be exceptional in design and redefine the skyline of New York." Libeskind acknowledged the dispute in a separate statement. "I have a tremendous respect for David's ability, and we both have strong opinions about design," Libeskind said. "Nothing worthwhile was ever created without some conflict, and what emerges from a collaboration should be even greater than the sum of its parts. The Freedom Tower will be no exception." I would venture to guess that since Libeskind's input has been sidelined up until now, this has more to do with "other" people not caring for Childs' initial design. Might as well have the full spectra of news reporting. October 23, 2003 -- Ground Zero master planner Daniel Libeskind stormed out of a meeting about the design of the site's Freedom Tower, threatening to break up his collaboration with the project's lead architect, David Childs, sources told The Post. After the Monday afternoon face-off, Libeskind also ordered several staffers working at Childs' Skidmore Owings &amp; Merrill offices to pack up their equipment and leave - but at least two of them returned to work the next day. Libeskind and Childs - the architect hired by WTC developer Larry Silverstein - have had an uneasy collaboration for months. But their differences came to a head this week - and in the aftermath, both sides were pointing fingers. "Childs said, 'Take it or leave it; this is what we're building.' Libeskind said, 'This doesn't fit into the master plan, and that's not acceptable,' " said one source. But other sources said it was Libeskind who delivered the ultimatum. "The guy [Libeskind] stormed out. He wants to build his own building," said a source. Libeskind wants a tower similar to the one in his original master plan, with an asymmetrical, skyscraping spire and antenna that evokes the raised torch of the Statue of Liberty. Childs is working on a design that's markedly different, incorporating a 70-story office tower that's topped by an unoccupied, lattice-like structure that rises into the skyline. Both architects have been working on designs that exceed the symbolic 1,776-foot height of Libeskind's original sketch. Under pressure from development officials, the two agreed to work together last July, with Childs as the lead architect and Libeskind in a vague role as collaborator. Officials downplayed the imbroglio and said they will bring the two together for another meeting tomorrow. "It's a typical architectural back and forth," said a source. "They're actually getting close [to solving their differences]." But another source said the architects' strongly contrasting visions could lead to a final falling-out. Libeskind has never built a skyscraper before and is primarily interested with coming up with an abstract shape that meshes with his master plan, sources said. Childs has built numerous office towers. Adding to the pressure on the two architects, Gov. Pataki is planning a major speech on the progress of lower Manhattan recovery for Oct. 30, and sources said he wants to point to their collaboration as a sign things are moving ahead. One insider said Libeskind may be hoping the stand-off will persuade the governor to side with him. I'm glad Libeskind is challenging him, Childs needs to be rattled out of his symmetry for this tower, I'm guessing. But I am curious to see both designs - they should let us decide! they should let us decide! Absolutely, although I doubt if that will happen. IMO, the Freedom Tower was the weakest link in Libeskind's original proposal. I felt it seriously needed to be beefed up. It sounds like Childs' design might do that. On the other hand, I'm not a believer in Childs' ability to stand up to Silverstein's "cost conciousness" to get the best design possible. Its also sounds like Libeskind's will have enclosed space (non-office) go up much higher than Childs'. I'm looking for the tower with a good deal of impact on the skyline. Its impossible to tell which version will have it at this point. I have to say I was hoping there would be some changes to the tower from what we've seen in the renderings. I've never liked the tower on the side, and it always seemed too narrow from the one angle, so I too hoped Childs would beef it up. But 70 floors and then an unoccupied latticework.....I need to see it. I don't think the "Freedom Tower" needs to be beefed up. Don't get me wrong, I think it needs to be tall in order to insure that nothing built downtown is taller than it for at least a generation or two. But I look at any rendering, and the thing is already outrageously huge, towering at twice the height of the massive American Express tower in front of it. Next time you look at the downtown skyline -- in real life -- honestly try to visualize it. It's more than OK if its bulk appears somewhat diminished at some angles-- it would be a nice effect, akin to what Childs almost accomplished at TWC. Libeskind, stick to your guns. "Adding to the pressure on the two architects, Gov. Pataki is planning a major speech on the progress of lower Manhattan recovery for Oct. 30, and sources said he wants to point to their collaboration as a sign things are moving ahead." A new creative spat over the rebuilding of Lower Manhattan surfaced this week. As David Dunlap wrote in yesterday's New York Times, Daniel Libeskind, the master designer for the site, and David Childs, the architect for the developer, Larry Silverstein, appear to be at odds over the 1,776-foot tower that will be the focal point for the site's new skyline. Mr. Libeskind originally sketched a sleek, asymmetrical tower that seemed to echo the Statue of Liberty in New York Harbor. Mr. Childs's design is not available to the public, but descriptions of a monolith that twists as it tapers upward make it sound a lot different than the structure envisioned in the Libeskind plan. Two independent, talented architects cannot be expected to collaborate easily, but they will have to work together if Gov. George Pataki hopes to make his deadline of starting the tower next summer. Nobody expects the final plan to look precisely the same as the powerful Libeskind proposal that won an international competition earlier this year. That does not mean, however, that the essence of Mr. Libeskind's plan should be slowly chipped away as Mr. Silverstein's architects convert it into reality. While Mr. Libeskind is said to be unhappy about the Silverstein version of his tower, he makes it a practice not to complain publicly. That makes it hard for New Yorkers to tell whether he has cause for alarm because they do not know what the new tower looks like. The Lower Manhattan Development Corporation should clear up the mystery by putting the Silverstein-Childs plan on its Web site. That way, people other than Mr. Libeskind can assess whether the changes do serious artistic damage to his grand design. This is a town full of architects and artists, and more than its share of critics. And the public's discerning eye has already saved the city once, in 2002, when the original site proposal was a mediocre cluster of monoliths. In recent weeks, the rebuilding at the site has progressed steadily: the temporary PATH train station is almost ready to open, and better leases for the city's airports will help clear up tax issues for the site. With all that good news, delays caused by a tussle between the two architectural superstars would be a disheartening step backward.